Chris Whitaker is one of those authors I’ve been wanting to read for at least a year now, partially to get Liz Barnsley (book influencer extraordinaire of Liz Loves Books fame) off my back, but partially because it sounds like he’s quite good. So when my colleague received a copy the other week, it seemed appropriate, nay, essential, to steal it. Summer Ryan is the shining light of Grace, Alabama. Unlike her troubled twin sister Raine (clever weather-related wordplay there), she’s a devout churchgoer, and a musical prodigy whose cello performances have moved the town to tears. But now she’s gone missing. Could she have run away? Or is she one of the so-called Briar Girls, teenaged-girls living in Briar County who have been abducted by the mysterious being known as the Bird? Unconvinced that the alcoholic police chief Black will succeed in bringing Summer home, or even that he believes she’s really in trouble, Raine enlists the deep-hearted teenage wannabe police officer Noah and his loyal friend Purv to help her investigate. Meanwhile, an angry black cloud hovers over the town, promising a storm, and exacerbating the already-heightened tensions. The whole town is teeming with secrets, and with everyone on high alert, they’re likely to rise to the surface. And between chapters, Summer tells us her own version of events that led to her disappearance. 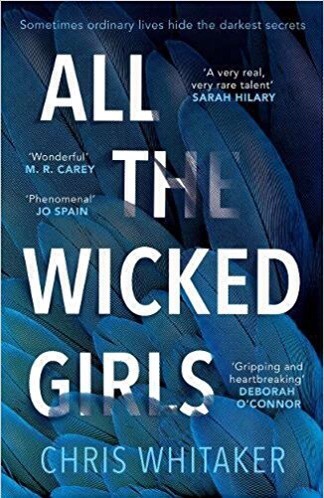 All The Wicked Girls is a gripping thriller, but also a deeply emotional story with a big heart and characters you’ll cry over. It’s a portrayal of a town left behind in an America which has apparently never been so prosperous, set in the late 80s’ but equally relevant to today. Although the town is meant to pull together as a community, an undercurrent of violence simmers constantly. And yet, we also have astonishing scenes of kindness and love, such Noah waiting in Purv’s back garden to await a sign that his friend has survived a beating from his father. It’s a thriller that explores the worst excesses of organised religion, but also the positives aspects of faith. I definitely sensed a Twin Peaks influence (but the bits from the first series I could get on board with rather than more recent episodes… “What’s going on? Are they miners?! WHAT’S GOING ON? !”) in the idea that not everything can be explained away, and sometimes things just happen. I’ll be stealing (more theft… Maybe Chris is a bad influence on me?) the copy of Tall Oaks I gave my father for Christmas, and look forward to reading whatever Chris Whitaker has to offer. Highly highly recommended! All The Wicked Girls by Chris Whitaker is out now, published by Zaffre.